Wednesday we got an early start and drove in a taxi. Our mission was two-fold: to see the accommodations we are planning to move to next on Dec 2nd, and, to experience the fabled hippie market that’s only open on Wednesdays. Our first stop was Sur La Mer….our friend Sanjiv has a home nearby and wanted us to meet the owner, his friend Aneel. Driving up a brick red rutted dirt road we did not know what to expect. Wow! Sur La Mer is a charming spot and we know we will be happy there. We headed to Anjuna and knew we were close when the traffic on the single lane road became clogged with tour buses, motorcycles, and taxis like ours. 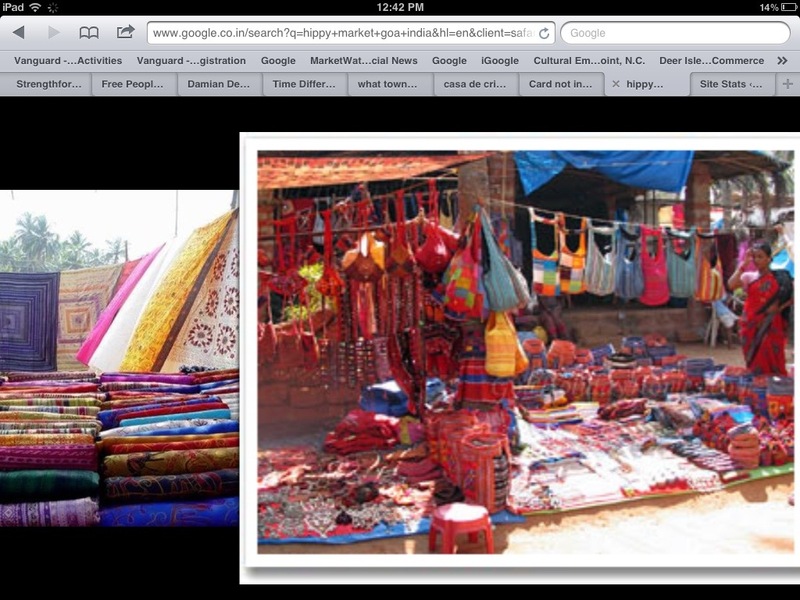 or bag or sari vendors had the same stuff. None of it very appealing, all of it covered in sandy dust. Hundreds of vendors, thousands of tourists…we did not see many shoppers carrying bags. Not sure if that is due to the global economy or because the goods were less than stellar. This entry was posted in Uncategorized and tagged Anjuna beach hippie market, cancer, going to oa blog, Scott Morgan, sur la mer morjim, traveling india. Bookmark the permalink.